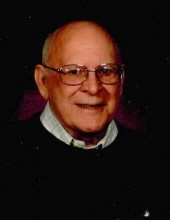 Robert Donald Carl (Bob) died peacefully at home in Davis, Illinois on March 14, 2019. He was eighty-eight years old. He was preceded in death by his loving wife, Ethel Jane (Ruis) Carl, his parents, Lawrence and Lillian (Hein) Carl, and six siblings: Dorothy Paulus, Frances Hendricks, Lawrence (John) Carl, Albert Carl, William Carl, and Joan Miller. Bob was born on July 22, 1930 in Bethlehem, Pennsylvania. He graduated from high school and went on to learn the printing trade. After moving to Chicago, he worked at Good News Press. While living there, he met Jane and they were married on June 14, 1952 in Pease, Minnesota. Bob and Jane, called "Dolly" by her family, were inseparable and enjoyed sixty-two years of marriage. Bob printed telephone books for many years with the General Telephone Company in Des Plaines, Illinois, where he was known for his work ethic and humor. After living in Rolling Meadows, Illinois for thirty years, he retired from printing to become an antiques dealer in Kalamazoo, Michigan. He greatly enjoyed fixing antique clocks and restoring furniture. Bob and Jane sold the antique store in 2001 and moved to Lake Summerset in Davis, Illinois. They lived in the community for eighteen years and made many friends. Survivors include his sister Kathryn Keith; children, Diane (James) Olson, Donna (Jay) Dahl, and Larry Carl; grandchildren Stephanie Rigby (Bradford), Sarah Long (Andrew), Kayla Rebarcak and Megan (Jeff) Pearse; great grandchildren Logan Pearse, Hayden Pearse, and Alexander Rigby; and numerous nieces and nephews. Burial will be at Durand Township Cemetery with a private, graveside ceremony. To send flowers or a remembrance gift to the family of Robert Donald Carl, please visit our Tribute Store. "Email Address" would like to share the life celebration of Robert Donald Carl. Click on the "link" to go to share a favorite memory or leave a condolence message for the family.